You are here: Home / Great Deals / Bread Is The Devil – Time With The Author – Heather Bauer! Bread Is The Devil – Time With The Author – Heather Bauer! 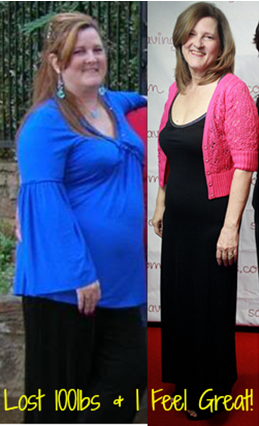 I have shared with you many times, about my weight loss -hopefully not too many to where you are sick of hearing it! You can see the difference 100 lbs makes in my earlier videos compared to my recent ones here. But, I wanted to share a couple of things with you today. I don’t eat many carbs – like almost none. So, I am always on the lookout for ways to eat bread and pasta and things like that – only without carbs! Not an easy task, for sure, but I have found some good things I can use and do in replacement. I LOVE my friend Karen’s homemade football day pepperoni bread – but I don’t use the pizza dough – I use Flatouts – I put a tiny bit of oil on them and place them in the oven to crisp them just a tad and then make it following Karen’s recipe! It’s very good! You can use hamburger or turkey or any kind of meat you want, if you aren’t a big pepperoni fan like me! I use ground turkey! Now, spaghetti, that’s been an issue. I do eat Dreamfield’s Pasta – cause it’s great on the low carb side. But, even with that, I have to have a quite small portion, and it doesn’t quite fill me up. 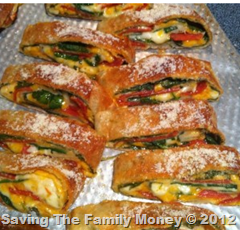 I had heard about using zucchini and veggies to make lasagnas and pastas with, but, hadn’t tried it. Well, had the opportunity to speak with Heather Bauer, R.D., C.D.N. 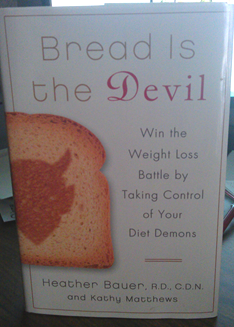 about her new book (she also sent me a copy to read) “Bread Is The Devil” – win the weight loss battle by taking control of your diet demons. She is a nutritionist and was able to give me some great pointers. 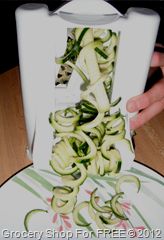 She said you can make “pasta” out of eggplant and out of zucchini! I love both, so I was glad to hear that! She also said to try Tofu Shirataki Noodles and GG Scandinavian Brand Crackers. The crackers are because I miss the crunch of croutons, or crackers & chips, so she said this was a great replacement for that! 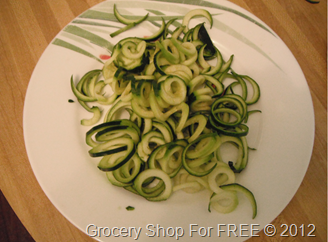 Honestly, I haven’t had the opportunity to try those, yet, but I was able to try the zucchini noodles! 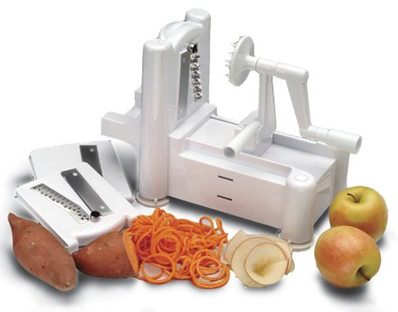 I saw this awesome Vegetable Slicer on Amazon and got it! It is so easy to use and you can store all the blades in a slide in area under it! I HATE not having a place for all the attachments that come with something like this. We then microwaved them for about a minute and put the sauce over them and enjoyed it very much! You can use any kind of sauce, I have heard people say they used pesto sauce, too. Bear watched us make them and said – “I’m not eating that.” Of course…, but, he tried them and later told me he really liked it! So, if you are looking to lower your carb intake, or lighten up your evening meals either way – this is great start! Please check out Heather’s book, it’s on sale right now on Amazon, too, for $12.49, down from $24.99! Stop mindlessly inhaling the breadbasket and stop shoveling in the M&M’S–Bread is the Devil is the solution to all of our diet saboteurs. Nutritionist Heather Bauer can count on the fingers of one hand the number of her clients who don’t already know what they should eat to lose weight. So why can’t they (and their best friend and their neighbor) lose weight? Because Bread is the Devil! Yes, that’s Bauer’s shorthand for the inevitable, demonic pull that certain bad habits exert on people who try to change their eating routines to drop the pounds. Many of us have been there: You had a sensible, healthy breakfast, high in protein with complex carbs. Ditto for lunch—soup and a salad with a warm rush of accomplishment and self control for dessert. But now it’s dinnertime and you’re out with friends: enter a large basket of warm, sliced, crusty sourdough bread with a little tub of chive butter. Suddenly you’re in the seventh circle of hell—the one reserved for gluttons. Bread’s not your devil? How about ice cream or chips or that big slab of buttercream-frosted birthday cake? Bread is the Devil will help you say good-bye to your devils, for good.